Your faith walk carries power when you know what to do with facts. Let hope fuel your faith, not inspire denial because of the intense desire to see change. People grow, yes, but not all people change. It is better stated that all people have the potential to change. They must want change. We must want change…and then we all must change. There are many dreams you hold close and nurture. Keep them close. Continue to develop plans. Do not, though, so tie yourself to the idea of the dream that the facts keep you from faith. Reserve your energy for FAITH activity. How? Just decide… and surrender the idea to the Father. Only He can make it real anyway. Ex. If you must create something (written word, spoken word, art, etc.) and you lack sufficient materials or funds, focus on how to create the way to fulfill the dream. Do not imagine the dream in a perfect world…because that leads to false hope, excuses and wasted time. 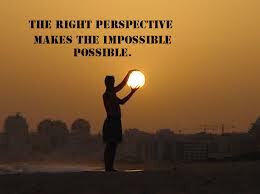 Perspective is powerful, and solely up to you how it serves your dream. Selah. Love you to life.